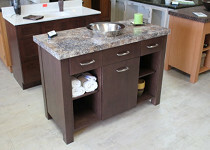 Services | Dale Kitchen & Bath Inc.
At Dale Kitchen & Bath we offer a wide variety of cabinetry types created with the highest quality materials available on the market. 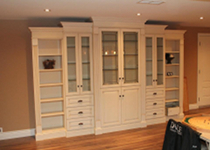 Whether you are looking to refinish your kitchen, bathroom, laundry room, bar area or home entertainment unit we are sure to offer a cabinetry solution for you. Each piece of cabinetry that leaves our shop comes in as raw pieces of material. At Dale Kitchen & Bath, we sell nothing but the best quality product that is hand made by our industry trained cabinetmaking professionals. 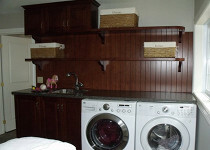 The addition of some cabinetry to your laundry area can help with storage solutions for detergents, clothes and other laundry related items. 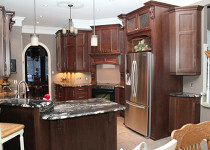 Come visit us at our showroom for more information! "From start to finish it has been a very positive experience and we would recommend you in a heartbeat. Thank you again!""